"...Although there are a few Sorrento attractions, keep in mind the importance of this town is not in big historical sights but in letting your senses enjoy..."
If you’re wondering what Sorrento attractions this little town is famous for and what the absolute must-sees are when you visit, remember this… the most charm of Sorrento Italy definitely lies in its natural setting: built over high cliffs, it offers dramatic views of the Bay of Naples and the Sorrentine peninsula. It was this, together with the lush vegetation around them, that attracted the poets and artists in the beginning. Moreover, there is also the Sorrento lemons digestive, the famous limoncello, great pizza, fantastic gelato and the Sorrento music boxes made in the inlaid wood technique that will make your trip worthwhile and memorable too. So, although there are a few Sorrento attractions, keep in mind the importance of this town is not in big historical sights but in letting your senses enjoy! Especially if Sorrento is just a stop on your way to Capri Italy or Pompeii Italy. 1. The Duomo dei San Filipo e Giacomo – this Sorrento landmark, the cathedral of Sorrento, stands at the corner of Corso Italia and Via R.R. Giuliani. You will recognize it by the gleaming Romanic façade of white stone. 2. 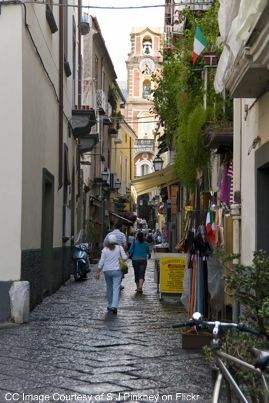 Piazza Tasso – this is the main square in Sorrento, from which all the other narrow streets of Sorrento branch out. It is named after Torquato Tasso, a 16 Ct poet, born in Sorrento. This is a lively, bustling square in which you will find an ATM, take a horse carriage for a ride or simply sit at one of the café terraces and enjoy a live orchestra as you sip on your espresso. This is also the place to sit down for a nice lunch… a delicious pizza perhaps! 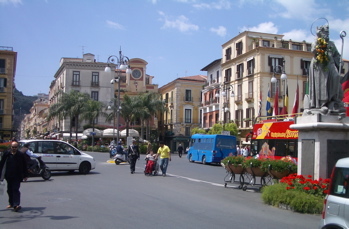 In this square you will also find a local bus stop to take you down to the Sorrento ferry port, Marina Piccola. 3. Sedile Dominova – this Sorrento attraction is one of the most impressive buildings in the city. It was built in the 14th Ct as a town hall where important men came to discuss politics some 400 years ago. Inside, this structure boasts some impressive frescos dating back to the 18th Ct. This historical landmark of Sorrento can be found right next to the cathedral’s bell-tower and you can locate it on our map of Sorrento Italy. 4. Church of San Francesco – this church is located in piazza San Francesco, close to the Villa Communale park, perfect for a little rest and enjoying the views. You can locate them on our map of Sorrento Italy. This structure first served as an ancient oratory, and was transformed into a church in the 14th Ct by Franciscan Friars. The predominant style of the church is a stucco rich baroque. There are some valuable frescoes and statues kept inside. The monastery and the cloisters that stand by the church are a must see! They are an architectural fusion of many styles, all the way back to pagan times! 5. Basilica di San Antonino – this one of Sorrento attractions is one of the largest churches of Sorrento. You will find this church, dedicated to the patron saint of Sorrento, in Piazza San Antonino. You can locate it on our map of Sorrento Italy. The church was constructed in the 10th Ct but its inside is a baroque one. There are many valuable artworks kept inside, as well as the tomb where the mortal remains of the saint are kept. As you enter the church through the lobby, pay attention to two whale ribs placed there by the people of Sorrento. Namely, the legend says that the saint saved a child from the mouth of a whale, and these two bones are a testimony to this miracle. 6. Piazza della Vittoria – this three shaded square that you can locate on our map of Sorrento Italy is a perfect spot for enjoying the views that Sorrento is so famous for. Apparently, this is where the temple to the Roman goddess Venus once stood. In this square, you will also be able to see the house of the famous Sorrento poet Torquato Tasso, now part of the Imperial Hotel Tramontano. 7. Sorrento Museum - Museo Correale di Terranova – this one of Sorrento attractions is situated inside the 18th Ct Palazzo Correale, in Via Correale, and once belonged to wealthy counts. You can locate it on our map of Sorrento Italy. The museum consists of the private collection of the counts of Terranova. You will enjoy this museum if you appreciate paintings from the 17th Ct, as well as Napoletan artists, decorative arts, Capodimonte porcelains and 18th Ct inlaid wood tables. The museum also features some Greek and Roman artefacts found in the area. 8. Sorrento Attractions: Museo Bottega della Tarsilignea – this workshop-museum is dedicated to preserving the tradition of the inlaid wood technique/wooden tarsias that Sorrento is so famous for. It is located in the 18th Ct Palazzo Pomarici Santomasi, easy to locate on our map of Sorrento Italy. Here you will be able to see wooden tarsias from the 15th Ct to the 19th Ct, furniture featuring marquetry work, get to know different techniques used in this art-form, the tools and materials used. If you would like to take a piece of inlaid wood home, you will be able to buy some made by modern day artisans.